Once the 800 pound gorilla in this year's Oscar race, the luster of Charlie Wilson's War has faded a bit now that everyone has actually seen it. It's a well made, solid piece of filmmaking...but Best Picture material it is not. 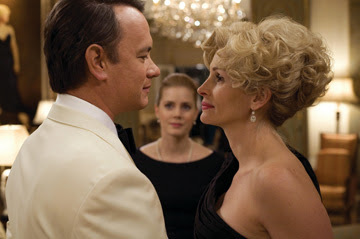 Directed by Mike Nichols (The Graduate, Angels in America) and starring Tom Hanks, Julia Roberts, and Philip Seymour Hoffman, Charlie Wilson's War tells the true story of Congressman Charlie Wilson (Hanks), who, with the help of a resourceful CIA agent (Hoffman) and a wealthy Texas socialite activist (Roberts), conducted a covert war against the Soviet Union by supplying Afghani militia with weapons and supplies to fight back against the Russian invaders. It's a fascinating story, the kind of thing that wouldn't be believable if it weren't true. 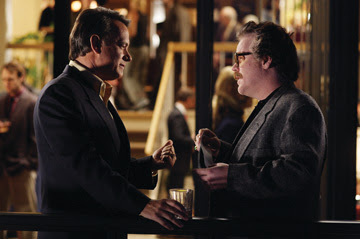 Nichols treats the story like a breezy caper film, call it Ocean's 11 meets Wag the Dog - where beautiful people speak in snappy, Aaron Sorkin scripted dialogue, drink champagne, and influence world events without mussing their perfectly coiffed locks. In other words, it's fun, nimble-footed, glamorous Hollywood entertainment. However, for a film with such powerful topicality, it totally fails to connect the importance of the events it portrays to our current situation. 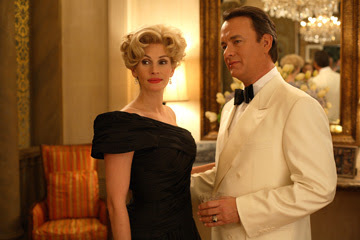 What Charlie Wilson did had a profound effect on world events with influences that are still felt today, but the film ignores this, preferring to end on a cheerful, upbeat note, ignoring the darkness born out of it. The film wimps out in the final act when it should go for the jugular. And I'm not saying this as the bleeding heart liberal that I am, I'm saying this as a person who likes his topical films to be, well, topical. There is more to this story than the one being told, and from the looks of things it was trimmed to be more mainstream friendly. Americans have stayed away from movies about Iraq and Afghanistan in droves, and the people behind Charlie Wilson's War clearly didn't want to be the next casualty. What we are left with is a movie with bite but no teeth. Aaron Sorkin gives the actors lots of great one liners, and Philip Seymour Hoffman gives yet another great performance this year (after stellar work in Before the Devil Knows You're Dead and The Savages). It is a good movie, a perfectly acceptable, entertaining film with the potential for broader appeal than most movies that have tackled similar subjects. But what is the price of success? Would you rather be a popular movie that is merely good, or a great movie that fewer people see? If only Charlie Wilson's War could have been both.